Play movies and music of any form on iPhone? Take photos or movies then backup? Make your favorite songs to iPhone ringtones? Afraid of unexpected iPhone breakdown and wanna backup your iPhone media? All possible with 1 iPhone Media Pack! 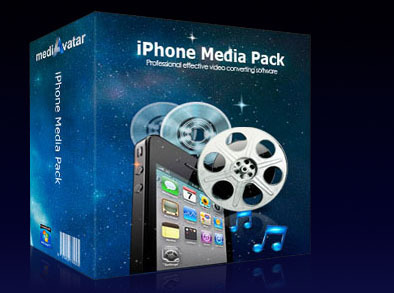 Just to your iPhone multimedia entertainment, mediAvatar iPhone Media Pack makes it possible to transfer any media files including DVD movies, audio CDs, high-definition or standard-definition video format files and audio files to iPhone either in movie, music or ringtone form! Not only convert and transfer files to iPhone, this incredible iPhone multimedia pack can even backup your iPhone movies, music and photos (all purchased from iTunes store and shot by your iPhone!) to your computer or iTunes library! Make full use of your iPhone and indulge yourself in amazing iPhone movies, music and ringtones now! The support for multi-core CPU accelerates the conversions from DVD to iPhone and video to iPhone. Extract any segment you want and convert it to iPhone video, music or ringtone. Split a long DVD chapter or video file into several short ones in your way to better improve your watching experience on iPhone. Both DVD to iPhone converter and iPhone movie converter provide ptimized output profiles best for iPhone, enabling iPhone fans to convert video to iPhone without any further settings. You can set different profiles for a single file to convert them at one time. Allows adding fade-in and fade-out effects to iPhone ringtones. After making your own iPhone ringtones, the iPhone ringtone maker can directly import ringtones to your iPhone or iTunes. Multi-threading and batch conversion enable you to fast convert multiple DVD titles or videos or audios to iPhone files in batches with a single click. Transfer files between your iPhone and PC.